Start making plans now to host a Valentine Murder Mystery Party for a Valentine party event your friends will never forget. A Killer Reunion is a romantic murder mystery game specifically designed for couples, with the added feature of being easy to customize to any decade. Make this year's Valentine get-together extra special by inviting your couple friends out for a night of mystery, romance and intrigue. Hosting a singles' or all girl party? Indulge in a relaxing spa murder mystery instead. As soon as you purchase one of these games you will be emailed a link to download it. You can print everything to host your Valentine Murder Mystery Party immediately after download. 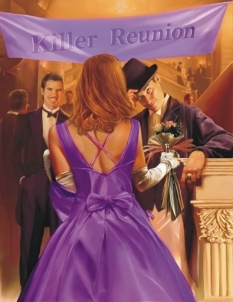 A Killer Reunion was written with the main suspects all being couples very much in love. Couples will be working together at times to achieve goals. They may have some secrets from each other, but overall they will be working to protect each other. This gives the game a romantic flavor. This murder mystery game is what we would call a 'clean' game. There are no affairs & people are basically good. This game is great for church groups, high school & college reunions or others who are worried about the possibility of offending guests. It can also be used for older teen groups!